Oklahoma has ordered a 40% reduction in fracking wastewater injection volumes as its earthquake epidemic continues. The new plan covers an area about the size of Connecticut in the central part of the state. It follows a similar instruction issued last month for northwestern Oklahoma that was instituted after the state felt its third-strongest earthquake ever recorded. Last year, the state saw 907 earthquakes, and has already had nearly 160 this year, the New York Times reports. And in 2014, Oklahoma recorded a total of 585 earthquakes of magnitude 3.0 or higher, more than in the previous 35 years combined. 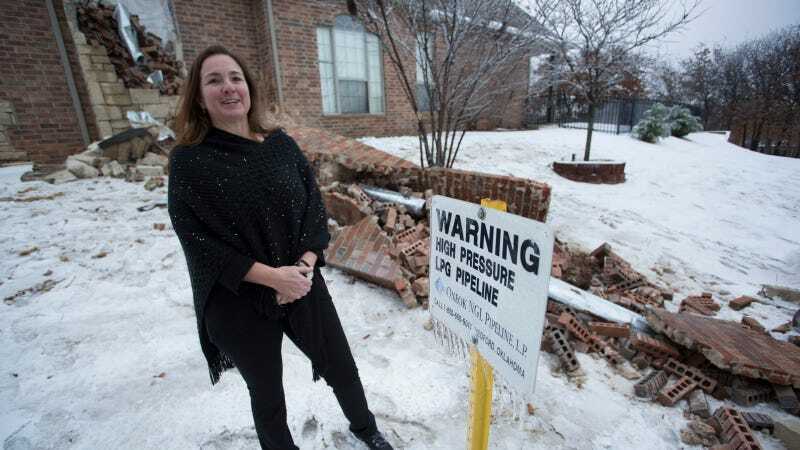 The Times alleges that state officials were slow to take action to curb the injection wells, which the U.S. Geological Survey has linked to the quakes, until this January, "after a series of small earthquakes damaged homes and interrupted power in Edmond, an Oklahoma City suburb home to many in the state’s political and financial elite." A week after the last of the Edmond quakes, the Times notes, Governor Mary Fallin allotted $1.4 million in state funds to the state geological survey and drilling authority, both of which had been chronically short of money. "Among other improvements, the money has allowed the state to beef up its earthquake monitoring network, hire a geophysicist and other staff members, and better monitor quakes." Oil and gas industry reps said they are disappointed with the new regulations, saying there was not enough science to warrant such broad impositions. But state officials say the plan was sound.